There was a fantastic research note going around last year summarizing the twenty year returns of various asset classes compared to the average investor. Somewhat unsurprisingly the latter ended up performing quite poorly against this basket. I think the average retail investor came away with annual returns of 2% during the twenty year period of the study, with only emerging markets in Asia, Japan and good old inflation performing worse than that. What was interesting though was not the worst performing asset class, but the best. Had I guessed beforehand I would’ve probably gone for something like technology or maybe the Russel 2000. The winner though turned out to be energy, which as an asset class delivered total returns of just over 12% compounded annually. I should add that this was before the crash in oil prices started in mid/late 2014. The results aren’t all that surprising perhaps, but something that might have been taken for granted by younger investors who haven’t seen multiple commodity cycles. Given that oil has been in the grip of a brutal bear market ever since let’s go over the returns of the cream of energy stocks: Exxon Mobil (NYSE: XOM). To get some idea of how high quality Exxon’s business is you just need to know one fact: Exxon is one of only three corporations that has a credit rating above that of the United States government (the other two are Microsoft and Johnson & Johnson in case you’re wondering). Regardless of whether you think that’s a true reflection of the company, or indeed of the USA, it is a remarkable statistic. It underlines the wide-moat business that the company has built over the decades; a business which runs from oil & natural gas exploration, all the way to production, refining, chemicals and the end consumers at gas stations. Behind that wide-moat business are two key competitive advantages that have made Exxon the powerhouse it is today. The first is the huge economies of scale it enjoys, giving it a lower cost basis on accessing reserves compared to smaller oil & gas production companies. The second is the fortress like strength of the balance sheet. In a downturn Exxon will be the last man standing, allowing them to snap up reserves and do M&A activity at a time when prices are nice and low. So what would a twenty year investment in the company look like today? Let’s take a look. After accounting for stock splits an investor could’ve picked up Exxon for about $21 per share in April of 1996. Let’s assume starting capital of $10,000, meaning our investor could’ve purchased 475 shares in today’s split adjusted terms. Today the shares are going in the market for around $80.30, giving us compounded share price appreciation of 7% a year over that period. Considering the recent oil price crash has wiped 40% from the 2014 share price that’s a fantastic performance. The original $10,000 in Exxon stock would be worth $37,600 today before taking into account any dividends. With Exxon it’s crucial to appreciate the degree to which share buybacks can contribute to returns over long time frames. If you dig up the annual report from fiscal year 1995 you’ll see that there were 4.968 billion shares outstanding in split adjusted terms. That figure is masked by the 1998 merger between Exxon and Mobil which resulted in the combined entity having 6.95 billion shares in issue. As of the end of 2015 the company reported 4.183 billion shares outstanding. In other words it has reduced a whopping 40% of the float over that time frame. This is the great thing about stocks that tend to generate tremendous amounts of free cash flow in that those compounding gains from buybacks will add up a lot over long time frames. The 7% compounded annual share price appreciation is also entirely without taking into account dividends either. In 1996 Exxon was paying a split adjusted annual dividend of $0.78 a share. The 2015 annual dividend amounted to $2.88 a share. So even without reinvestment the per share dividend has almost quadrupled in that time frame. 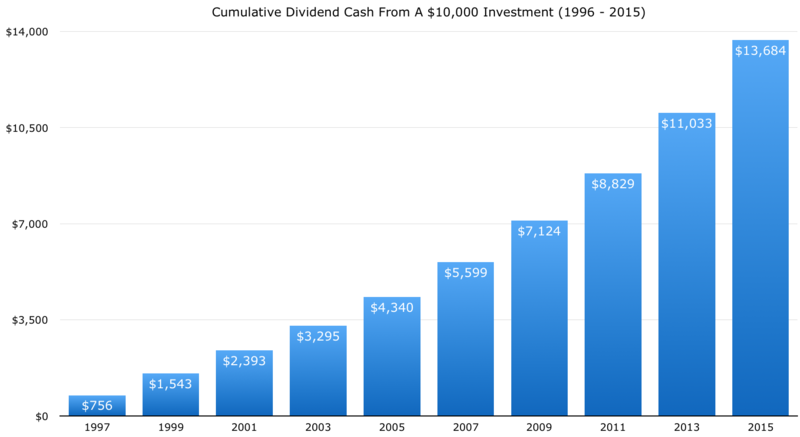 In total Exxon would have paid out around $13,680 in cash dividends on the initial $10,000 investment. That’s assuming they accumulated in a broker account and were not reinvested into more shares either. Adding those dividends to the $37,600 worth of Exxon stock works out to a total return of $51,280 – equivalent to annual returns of 8.5% compounded per year. What if those dividends had been reinvested automatically into more Exxon stock? As you can imagine the returns would have been even greater in that case. The DRIP calculator shows a total return of $63,650 on the $10,000 outlay – equivalent to compounded annual returns of 9.5%. It’s a great performance, especially considering the following two points. Firstly, those returns have obviously been reduced by the carnage in the energy sector over the past 18 months. In other words you’re getting a fuller picture over a full commodity cycle. Secondly, Exxon Mobil was already one of the world’s largest corporations back in the mid-Nineties. Size becomes less relevant with high quality stocks at sensible valuations because they can deliver great returns just by showering shareholders with cash dividends and buybacks. And where does Exxon derive its quality earnings from? Huge economies of scale that allow it to extract resources at a fraction of the cost compared to smaller competitors. The diversified nature of the business gives it extra stability during slumps as well. When prices are falling and leveraged producers are getting into trouble it’ll be giants like Exxon picking them up cheaply. The added benefit is that in periods of higher yields any dividends reinvested into more stock will deliver incredible returns down the line. In periods of huge price declines it’s like a down payment for the volatility, and something which will pay off when the next cycle comes around.